SuperYenta regulars know I’m a huge fan of The Times’ Vows column. The weekly stories are little postcards from Marriageville, each with its own “how we got here” story. I especially like how the columns mention making lists for your ideal mate as if it is – and should be – de rigueur. The SuperYenta always says, “Exactly!” or “Go on, girl!” when she reads this in a Sunday’s Vows. This past Sunday was no exception. Nikki Johnson, a woman after my own heart, held out until she was 42 so that she could find a man who matched her, “handwritten compilation of the 50 or 60 traits and characteristics she wanted in a mate.” Now Nikki, you know the SuperYenta recommends starting with 50 and narrowing that list down to, say, seven or ten traits. But if you got all 60 in one guy, you’re a super star. And I don’t care where you put your traits. Like Nikki, you can write them by hand and keep adding to them over time. You can keep a spreadsheet on your computer. You can put them on the back of a business card and put it in your wallet. Tattoo them on the inside of your arm, put them in a bottle and send them out to sea, add them to your email signature…..I don’t care as long as you make your list and publicize it. Way to go, Nikki and Raymond Johnson. This SuperYenta thinks you’re super. *For more terrific marketing tips, get yourself a copy of Rachel Greenwald’s Find a Husband book and read the chapter on marketing. It’s a new year, and a great time to take stock in your online dating profile. Your SuperYenta will gladly share the top five most frequent mistakes she sees to help you use 21st Century tools to find your beshert. Before you read on, please open your mind and your online dating profile and commit to making changes (for the better) for the new year. Never, ever use this phrase: I am as comfortable in jeans as in a tux. Don’t be swayed into this boring and tired catch phrase just because everyone else uses it! Are you so over dating that you can’t come up with something slightly more creative to indicate you have diverse interests and styles? If you are not, contact your SuperYenta! As a bonus, I’ll throw in another phrase to avoid: I like romantic walks on the beach. Who doesn’t? Including this in your profile makes you sound repetitive and desperate for the feeling one gets on a romantic walk. Your SuperYenta wants you to come up with something that actually represents how you spend your time. If you like to go antiquing, play Guitar Hero, or people watch at airports, be honest about it. Remember the law of numbers: Resolve to “go shopping” for at least three new people to contact each week, and contact them. Do not poke them, or “flirt” with them. Send each one actual messages pulling a factoid from their profile into your email, such as, “I’m glad you mentioned Scrabble because over the holidays, I played Scrabble with my 96-year old Aunt Edna for three nights straight.” Some schlemiels will never reply (those who do not reply do not deserve to meet you anyway), some will. Reply to everyone who contacts you. Even if they are three-eyed trolls, even if you are not interested, the most appropriate way to participate in online dating is to reply to everyone who contacts you. Remember that someone contacting you may have just read my “law of numbers” resolution up above. The flipside of this resolution is this: if the wrong person keeps contacting you (for example, if you are 40 and a 27-year old is flirting with you through chat), politely extricate yourself and cut off all contact, no matter how scintillating, and never contact them again. Is a 27-year old ready to marry you? Not likely. Do not lose faith. Online dating is your way to stay flexible and limber in what for some is a quagmire and for some is a ball. Be loud and proud! And if you get discouraged, simply contact your SuperYenta for a pep talk. Now get out there and update your profile! There was an article in the New York Times about all of the Buddhist tourist attractions in San Francisco. It closed with a quote from the great Buddha: All living beings, whether they know it or not, are following this path. It is important to remember that you are not alone on your quest to find someone to marry. You know how people say “Timing is everything?” The point of that statement is someone out there right now is also on a path to find their beshert. You may find this person at your next intersection. The goal is to make sure you’re focused on your path so that when another wayfarer crosses your path at the right time, you’ll be ready. And guess what? There are other people on the path too, like SuperYenta, who are here to help you stay the course and quit the one night stands and the little relationships that can never go anywhere. Lean on these people to help you stay focused. Some of my clients say they come off as desperate on dates because they want love so badly, and this desperate feeling ruins their time on the date. Their paths are rocky, littered with expectations and memories of the past. Remember that your journey needs a path, which has a beginning and an end. The journey itself, in this case, is not your destination. When you relax, follow my rules, and understand that your journey will not last forever, you just may meet someone at the next intersection. You could say that I am a walking contradiction (aren't most humans?!). I prefer to think I am multi-faceted. - I love to entertain. I often plan theme parties to support my love of costuming. My attic has since been turned into a giant costume closet. You know what you want in life and are working in that direction. You understand yourself and can communicate your thoughts and feelings. You are confident but not narcissistic, ambitious but not a bull, emotional but not needy, able to give and receive love, and you are looking for someone to be your partner in crime, love and life. And then of course there is that beautiful thing we call chemistry – that is a must-have. Bonus points if you are handy and love to travel. Notes from SuperYenta: Your online description needs to be personal and specific but not so specific that people wonder, “What the heck is this person talking about? Farm animals?” Write something that needs no explanation and does not sound mysterious, illegal, bored, or over it. In Karen’s interview, I discovered that she goes to great lengths to make children comfortable in her home. I highlighted this as an attribute, because with all her partying, it is important for men to know that she loves kids and is comfortable around them. Karen’s About You was well-thought out. I liked its breadth and that it didn’t sound like a checklist of bad attributes from her prior relationships. I also liked that she mentioned communication. I think bad communicators will read that and move on, exactly what she wants them to do. I am the antidote to your boring dating life. Growing up in the country gave me down-on-the-farm earthiness (I entered a prized goat in the county fair) yet I love nothing more than my urban life here in (city withheld). I am happy out and about, and I love to entertain and throw parties at my own house. I also cherish quiet moments at home with my dog. I am professional, but I am more of a “work to live, not live to work” person. I love to travel and when I go, I like to spend a big chunk of time in interesting places, such as Buenos Aires or Tulum. Socially, I love to attend public festivals and big goings-on and plan and attend theme parties in costume. At Burning Man to Carnivale or the Pride Parade, you’ll typically find me either as part of the action or as an enthusiastic cheerleader on the sidelines, or the one hosting the costumed after-party. Family is very important to me and I hope it is for you too. I grew up nearby and see my extended family often. Many of my friends have children and I love including them in my life. Oftentimes, they themselves are the life of the parties. I am old enough to know that I need someone who can join me at all of these places: from the outrageous and high-spirited to the restful and family-focused. I can guarantee a terrific time. Can you? Okay Karen, you’ve been Yenta-fied! Let us know how the revised profile fares online. 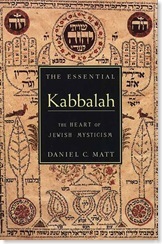 I was fortunate enough to take a Kabbalah class last week with Dr. Daniel Matt. In the class, we read from his book, The Essential Kabbalah. Whatever one implants firmly in the mind becomes the essential thing. So if you pray and offer a blessing to God, or if you wish your intention to be true, imagine that you are light. All around you—in every corner and on every side—is light. If you are searching for love, this passage relates precisely to your search. The passage essentially says, put your intention out there and you will experience what you intend. Do not be afraid to set your intention to find your partner even within a specific timeframe. Such as, by the end of the year I will have found the person I’m going to marry. I was inspired a few years ago by a woman I met named Hannah. She was a successful businesswoman who like a lot of us didn’t invest a lot of time in finding someone to marry. Suddenly she realized how badly she wanted to have babies. A husband, she thought, would be just the solution for getting started on the path to parenthood. Being an intellectual and introspective person, she sat down to figure out the shortest distance from single hood to partner hood. In doing this, she realized that she never applied the same management principles to dating that she had to her career or business life. So she devised the Hannah Method. Be crystal clear about what you want out of dating and a relationship. There’s no shame in being totally honest and up front with every potential date you meet that you are in the game for the high stakes. If you believe that finding the right person is about timing, then this is the tactic for you. Prepare a list of questions for any potential date that reveal key insights about your list of no-budge issues. For Hannah, having children—and fast—was her top priority. Within the first few minutes of meeting a potential date, she’d ask, “Do you like children?” or “Do you want children?” or “Does anybody in your life have children you see regularly?” The answers to these questions will tell you if the person is on your wavelength about the things that are important to you. Have a team. In business, all successful projects have a great team to back them up. Hannah recommended your team consist of one married woman (the thinking here is that a married girlfriend would not feel a loss if you left the group and is not competing with you for available men) and one single man who you are definitely not interested in. After each interaction with a potential man, review the event with your team. (SuperYenta tried this tactic and it was so much fun. One evening I took my team out to discuss my prospects at a favorite local bar. While we were there, I met a cute guy at the bar and it felt wonderful to have my team backing me up in real time!) Take your team’s advice in stride and devise your next plan of action. Test your theory. Hannah thought it was crucial to check and double check that her hunches were correct. One of her no-budge issues was kindness. So she devised tests to make sure her dates were kind. She would, for example, spill her water on a date to see how the guy reacted. If he thought of her first, mopped her off and went to get help, she thought the guy was a keeper. If he got mad or annoyed or did anything ungentlemanly, she moved on. View your prospects in the light of day. It was Hannah who lit the fire for me to start having daytime dates only. Right after I met Hannah, I met a sweet guy who asked me out to a fancy restaurant on our first date. In the haze of candlelight and wine, plus the noise of the restaurant, I found I had nothing to talk to this guy about. Six months later I saw his wedding announcement in the New York Times. The article painted him as a very interesting guy. Had I taken Hannah’s advice and met him for a walk or for coffee during a weekend day, I might have had a chance to get to know him better. Do not move forward physically until you know you really like the person. Like is different from lust. Hannah advocated a no-kissing approach until all of the above issues were settled. The Hannah Method has a lot of steps and requires some deep thinking and a big dose of patience. If you were as thoughtful about your social life as you are about your career, you’d be married by now! Try it! When I was in my mid-20s, I had a friend named Ellen. As twenty-something gals will do, we talked about dating all the time. Ellen said two things I’ll never forget. One, after a particularly harsh break up of mine, was, “There’s nothing wrong with you that a bottle of cheap nail polish won’t fix,” and she was right. I still wear the shade of automotive red she handed me as a breakup consolation present. The second was, “I’m tired of being down about being single. The famous women in history were out there….being famous! I’m going to start having one hell of a life,” and she did. She quit her job to go traveling with an old friend from high school. After traveling all over the world and getting into all kinds of hi-jinx, she married that friend. My current favorite single (straight) woman just finished the AIDS ride. The AIDS ride! 500 miles of grueling biking from San Francisco to Los Angeles with thousands of gay men. This woman has already run marathons, done Team In Training, completed triathlons, swam to Alcatraz and back and more. 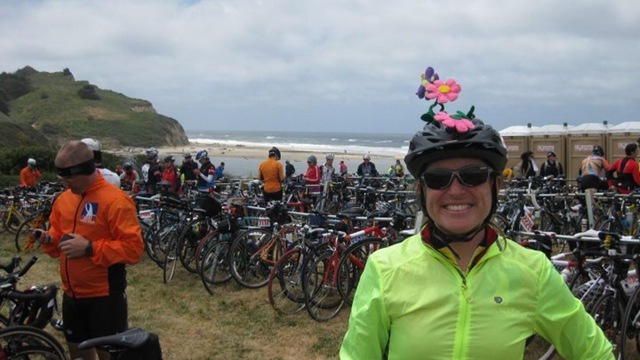 The AIDS ride represented a way to raise money for a great cause and put herself up to a new physical challenge. Even though there was little chance she’d meet Mr. Perfect on this trip, she was looking for a huge and rewarding adventure. Another woman with a hell of a life! My point is, it’s never too late to start having one hell of a life. I was reminded of this important lesson while reading Sunday’s Vows column. Here’s what struck me about the bride: “She began behaving as if she was already in love. “You carry yourself differently when you’re not alone,” she explained. “I would carry myself at a party or a supermarket or a gym as if I was loved.”” This woman decided that husband or no husband, she was going to have one hell of a life. I love this attitude. Should I tell you the end of this story? It ain’t like the ending of the Titanic. You guessed it: bride and groom sail away into the sunset, married. So, have yourself a hell of a life! Take a trip, volunteer, step up and do something for someone else that takes you way out of your comfort zone. You may discover exactly what you’re looking for when you carry yourself with love and purpose. Ask yourself what you really want. If you want to date to have fun with no current interest in settling down, be honest with yourself and your date about this. If you are dating to find the right person to get married to and soon, do not be afraid to be honest about this to yourself and your date. (As a personal note, I only fix up people who are serious about finding someone to marry). Remember: everyone deserves to get what they want. Everyone, including you, deserves to be happy and to share love. Have a rough idea of what your past mistakes are. Do you always date people who are truly unavailable? Try to find patterns in past mistakes and break them. Following Tip #1 might help you break this cycle. Take a look in the mirror. One of the couples whom I fixed up were each required to read the chapter on “packaging” from Rachel Greenwald’s Find a Husband After 35: Using what I learned at Harvard Business School so they would take how they looked seriously when they met each other. She went to a personal shopper, he asked a friend to help and voila, they are married. Another tip from Rachel Greenwald: if you are looking for someone to marry, tell everyone you know. Ask everyone, even the person who cuts your hair, to think of you when they meet someone special. This can lead to some very entertaining offbeat dates as well as meeting a special someone. Best of luck to you! I hope you find your beshert.